The blog has been so silent. I took the month of January off, and though I ate tacos plenty and burritos manifold, revisiting some dear old taco shop acquaintances, I visited no new taco shops. The cincuenta taquerías project has concluded. I visited 60 different Los Angeles-area taco shops in the year 2010. It was a worthwhile and rewarding project and I conclude by recommending such projects. The taco project made my 2010 memorable. It is good to define a project, no matter how trivial or irrelevant, and then set out to do it, and then do it. Furthermore, it is good to visit taco shops and eat tacos whether you are self-reflective about it or not. I will keep the blog active and post to it occasionally when I have something to say about tacos or taco shops, but the updates may be more like monthly than weekly. I recommend The Great Taco Hunt for your regular taco news fix. Furthermore, I intend to collate my photos and writings from the past year and design a book, which I will make to be published. I expect that only one copy will be sold, and to myself. I will take good care of it, and then donate it late in life to an important research library. My hope is that it finds its way into the hands of a taco archaeologist 100 years from now, when society has plunged deep into the Mad Max-Max Headroom days but there will still be some weird Brazil scene where a nerdy guy with thick glasses is conducting obscure research in a grey jumpsuit in a grey room with a typewriter hooked up to a computer who needs to know about the world of tacos in the year 2010. This book is dedicated to you, future nerd version of myself. I will announce the book’s publication to my blog’s half-dozen readers when it is ready. 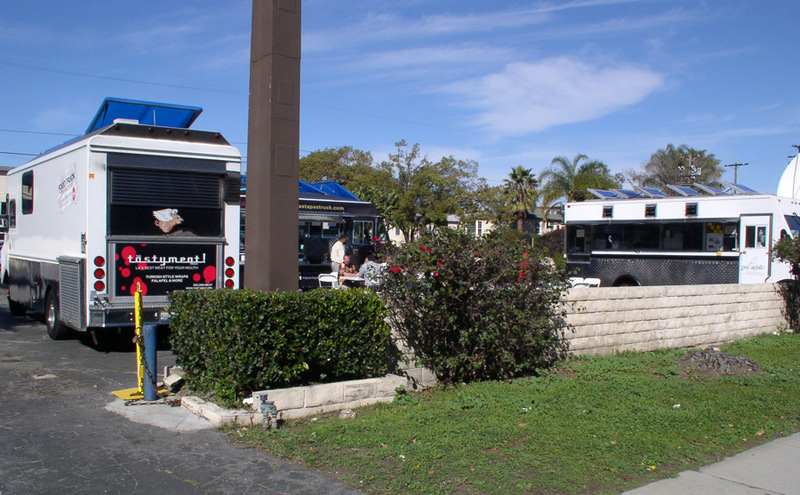 Last week I learned that the underused parking lot at the former bank building at the corner of Washington and Overland in Culver City has been rechristened “Westside Food Truck Central,” and several days a week plays host to a revolving set of gourmet food trucks. Five minutes from my office! Ambivalent feelings of the twitter-driven gourmet food truck “scene” must be set aside when it actually is convenient and appealing to eat from gourmet food trucks. I cheerfully try to convince myself that life must be awesome, that has such gourmet food trucks in it! Amidst fine weather I visited today and found three food trucks circled around a collection of folding tables and chairs. I was compelled and excited to visit the Lomo Arigato truck and order a Lomo Saltado. Lomo saltado, a stir fry of beef loin, onion, tomato, and french fries in a soy sauce-based sauce, served with rice, is a Chinese-influenced staple of Peruvian cuisine, and truly one of the finest creations known to the international community of humankind. 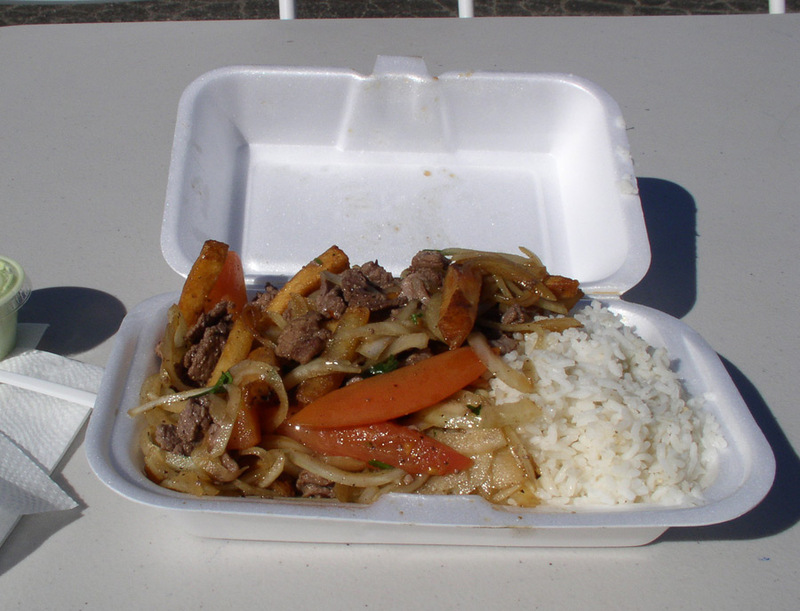 The Lomo Arigato version is not the best lomo saltado in town, but is quite good, and large and filling; it’s cheaper than going to a Peruvian restaurant at $8; and it comes from a truck. It was most pleasing, actually. Its thinly-sliced meat and long-cooked onions reflect Lomo Arigato’s Japanese influence – the dish recalls a version of Gyu Don (which is to say, what you get when you order a Yoshinoya Beef Bowl) with tomatoes and french fries thrown into the mix. Speaking of Lomo, I am pleased to announce that I have more or less launched my new blog project. It is entitled The Lower Modernisms and is hosted at http://lomo.architectureburger.com/ . Its subject is architecture and design, specifically those forms of design that are Modernist in style and intent, but fall just short of meeting the minimum standards of actual Modernism. (You must be this Modernist to ride the Modernism ride). Whereas I knew nothing and had no opinions about tacos prior to 2010, I have been stockpiling opinions on crappy Los Angeles Modernizing architecture for years, so I intend to post more frequently than I did post here to my fondly thought-of, but now historical, taco blog project. Thank you, dear half-dozen readers, for your kind support. NIce info on gyudon nouvele cuisine. Fries and tomatoes!! in tghe mix. Wow.